When someone adds you to a group, a notification is sent to your Facebook Home page. The next time you log in, you’ll see a little red flag over the notifications icon. When you click, it will tell you what the group is and who added you; then you can go check out the group and make sure you want to be a part of it. When looking at a group, you’ll find a lot to pore over. Some pieces of the group will look familiar — for example, the Share box and the recent posts from group members in the center of the page. Other parts are unique to groups, such as the photos at the top of the page and the tabs for different sections of the groups. You can get to any particular group from your Home page by clicking its name in the left sidebar. Groups you look at frequently should be in the top section; you may have to click the See More link to see a full list of your groups. Click the name of the group you want to visit. When you first visit a group, before doing anything else, make sure you want to be a part of that group. Although your notification may explain that you were invited to join the group, these invitations work by adding you to the group until you decide to leave it. It’s sort of like saying “RSVP regrets only” on an invitation to a party. 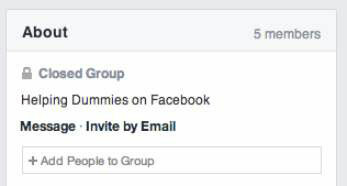 The first thing you should look at when you join a group is the name of the group and who added you. Often, that is enough to determine if you want to stick around. If you’re unsure about wanting to be a part of a group, check out the recent posts in the center of the page. These posts are ones that group members have shared directly with this group. Looking at the recent posts tells you a lot about what to expect from a group in the future. Are posts relevant to the group or not? Is there a lot of discussion or not? Are you interested in the posts you’re seeing? If the group was created only recently, you may not find very many posts yet. You can still learn a bit about the group by checking out the About section. On the right side of the group’s page (next to the recent posts) is a box labeled About. Open: Open groups are publicly visible and available for anyone to join. In other words, anyone who uses Facebook will be able to see the posts and the members of that group. Secret: Secret groups are the most private groups. No one other than those who have been added to it can see that it exists, who its members are, and the posts that have been made. If you’re invited to join a secret group and you choose to leave it, you won’t be able to add yourself again later on, because you won’t be able to find it. Info: Any information the group creator enters will appear in the Info section of the group. Usually people use the space to describe what the group is about and how people ought to use it. Members: Next to the word About is the member count. You can click it to be taken to the Members tab and peruse who belongs to the group. If it’s a big group that’s open and united around a big topic like a political cause, you may not know many members. If it’s a smaller group united around a local activity, chances are you know more of them. It’s located on the right side of the page, across from all the different tabs for the group. When you click it, a drop-down menu appears. Select Leave Group from the drop-down menu. A pop-up window opens, asking if you are sure that you want to leave the group. Decide whether you want to prevent members of the group from adding you again by selecting or deselecting the Prevent Other Members of This Group from Re-adding You check box. You can leave this check box selected, which means you’ll never be able to be added to the group again; or if you think maybe in the future you might want to be part of the group, deselect this check box. More often than not, however, you’ll usually decide to stay in the group, which actually brings you to the point of sharing and communicating with fellow group members. If you’re considering leaving a group because you’re being inundated by notifications about new posts, you can instead just turn off notifications from that group. From the group, click the Notifications button at the top of the page. 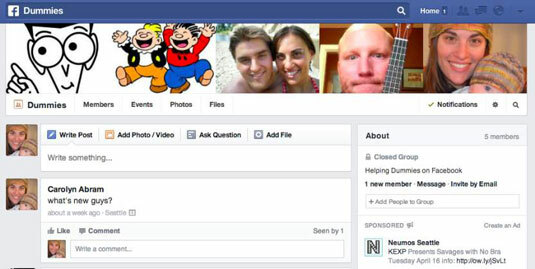 You can then select whether you want all notifications, notifications about friends’ posts, or no notifications.